This document covers issues relating to the use of the SARTrack system during an Search and Rescue Operation (SAROP). It also talks about Network, Internet access and Power issues at remote locations. Before any SAR Operation (SAROP), you must make sure that all computers, network equipment, trackers, radio equipment etc. are all properly set up and ready for deployment. This chapter will concentrate on all SARTrack related issues, but also on Networking and Power requirements. All SARTrack computers used during a SAROP must be using the SAME version. So make sure that all your laptops are updated all the time. I strongly suggest that you download the latest SARTrack install package from the server ( http://www.sartrack.co.nz/News.html ) before a SAROP, and copy it on a USB stick to be used on-site to update any laptops which have an older version (or to install new ones). There must be one dedicated SARTrack laptop available for a SAROP an all times. This laptop will act (and must be set up) as the 'Server' and be the primary Operations Log database. This means, it should be about the first item to get switched on when arriving at location, ready to accept the first operational Log entries, even before the local LAN or WIFI is set up. Make sure this laptop always has the SARTrack 'local server' running, so all other laptops can connect to it and share all data. You can find this in Setup/General/Local_Server. This dedicated laptop should also have your unique GROUP ID set up (in Setup/SAR). Every SAR organisation in the world should have a unique Group ID selected, which is a number between 100 and 25600. This ID will be used for all Operations Log transmissions and encryption between computers in your group. Once you have selected your initial random Group ID, it should never be changed. All SARTrack computers used within your group, must be set up with the same Group ID. Every SARTrack laptop needs its own unique Callsign and linked Passcode. If Amateur Radio callsigns are used, you can use a single Callsign for all SARTrack computers, but with sepparate SSID's: -1 to -15. The Passcode is linked to the basic Callsign, so in this case would be the same for all computers. Without a valid Passcode, the SARTrack computers will not be able to connect to an APRS server. If you make up your own Callsign's please contact SARTrack Limited for Callsign allocation and Passcodes. To be able to work off-line (without access to the Internet) and still be able to use the OSM (topographical and satellite) maps, they should first be bulk-downloaded, for the area's you normally work in, and for each Map separately. This can be done in the OSM Map window, by selecting 'Bulk download'. Please read the Help on this function. As bulk-download is a real burden on the OSM Servers, please do this one time only, and then copy the OSM maps to all other computers used in the SAROP. Simply copy the entire directory tree OSMMAPS onto a USB stick, and then Paste it (Merge it) on all other SARTrack computers used in the SAROP. If required, you can do this on-site. Make sure to close the SARTrack program before you do this! If there where originally Map Tiles on the target computer which you still would like to access, you need to rebuild the Database on the target computer. Else you will have access to the newly copied Map's only. The basic principle of the SARTrack system during a SAROP is the use of a local LAN/WIFI network, so many SARTrack laptops can be connected to each other and share all data: The Operations Log, Messaging, Tracking of teams, Objects and Search Areas on the Map, etc. This makes it possible to for example, have one laptop show the Map, another the Operations Log, another the Log TimeLine, etc. An IT person can sit in the Operations area communicating with the Radio operator via the Operations Log, while the Operations Manager can use another laptop to view the same Operations Log (in Sequential, TimeLine or Bulletin board mode). Also, it enables you to share all other non-SARTrack PC data between computers, and to connect to a printer. The simplest way is to use a WIFI Access Point (AP), which can be purchased cheap anywhere. However, please do make sure that this AP works properly without it being connected to the Internet (via the WAN port). That is, it should work as a local LAN even if the WAN port is NOT connected. Some AP's will not work properly in that situation. I strongly suggest that a dedicated AP is used. Buy an AP with an external antenna, or one which is documented to be for 'long range'. Many new AP's are designed for very short range only and use an internal antenna. This AP should be set up either with NO encryption enabled, or with WPA2 encryption, and a password which is taped to the AP box itself! It is no use arriving with a AP when nobody knows how to log on to it. Also tape the IP address, Web Login and Password to the box, so you can get in to make changes. The default settings in the AP should be okay, just give it a SSID (name) which makes sense, like your SAR group name. Also, set the WIFI radio Channel Number to 11, which is least likely to be interfered with. If at all possible, do not let other SAR members bring their own AP's and use them at the same location, unless they are guaranteed set up on a different channel. Interference between WIFI AP's can cause major packet-loss problems and cause SARTrack computers to lose individual data. It is extremely important that the AP always has power, even when the Generator suddenly stops! When the network fails, all connections between the computers will be down, and SARTrack clients (which keep their own copies of everything) will mis out on data. The best way to make sure this never happens, it to use an AP which can work on 12 volt. You can see this on the power supply which came with it. If it is a 12 volt unit, you can connect it directly to a car battery (or any small portable 12 volt lead-acid battery) by making a special cable for this purpose. When you have the AP in an Operations caravan or vehicle, make a permanent connection to the 12 volt system, instead of relying on an external Generator power source. Alternatively, use a large Inverter running on car batteries for all critical equipment which cannot run directly on 12 volt. More about remote Power issues. Most AP's also have several LAN ports at the back. It is not a bad idea to have the 'Server' laptop connect to the AP by cable, instead of the wireless connection, to increase reliability. So, bring some long network cables, and duct tape to secure them. **********************ALL COMPUTERS Must have the correct time!!!! Internet access at remote locations. It is of great use when you can have Internet access at the remote Operations location. When a two-way Satellite connection is used, we can assume that call computers on the LAN/WIFI have full two-way Internet access. The Satellite access system itself falls outside the scope of this document. However, please apply all recommendations regarding the AP as noted above. For Mobile Broadband (GSM) access, there are USB dongles available from your local network provider. Buy a long USB extension cable, possibly 20 meters. These cables have internal amplifiers at various positions. Make sure to test the USB Dongle and cable combination to make sure it works properly. The SARTrack computer which has the Internet dongle plugged in, should also be connected to an APRS Server. This can be the worldwide APRS-IS network (Amateur Radio callsigns only), the worldwide FireNet network, or a private Search and Rescue APRS Server (like sartrack.nl). For SARTrack use, it does not make any difference which local laptop has the Internet access. As long as all SARTrack computers on the local LAN/WIFI are connected, the SARTrack data from all laptops will also be transferred to and from the Internet server. It is possible to set up the computer with the Broadband dongle to share the Internet access with all other computers on the local LAN. This is possible with Windows 7 or higher, but my own experience has shown that it is extremely difficult to set up, and is unreliable under Windows 7. Unless some special software tool is used designed for the purpose of sharing the Internet access with other computers, I cannot recommend it. Note that the local SARTrack APRS network does not require this for Internet access, except that it is not possible for all other local SARTrack computers to download more OSM Map tiles. So, a Search and Rescue Operation (SAROP) has initiated at a remote location in the bush and/or mountains. Operations must be set up in a local building, hut or tent. If you are lucky, you can set up your mobile SAR Operations vehicle (a caravan or RV). The latter would make life much easier, as you can have immediate power and the computers, LAN and radio equipment are available in the vehicle. This document assumes the 'worst case' scenario where you arrive at a location with only a hut or tent, and no electricity. Obviously, depending on weather situation, you need to get under a roof, and set up some tables and chairs to work on. The next step is to start up the primary Laptop, which will have the SARTrack Server and Operations Log on it. You can now start a new SAR Operation on this laptop, using a new Name for the SAROP. In the Operations Log window, select "New Active Log". Enter a Name for the current SAROP, and the name of the initial Operator. The previous Log will be saved and the new one starts with a clean slate. You can now enter your first Log entry, indicating the start of the SAROP. This procedure is required for all SARtrack computers which come on-line later! The next step is setting up the power at the site. As discussed in the 'Preparation' chapter, make sure that all critical equipment like the local LAN/WIFI Access Point (AP) are running on a power source which is not interrupted when the local generator stops. Set up the local AP at such a location that the best coverage is achieved. Don't forget: It is just a mini radio repeater. It needs to be at a location where all WIFI enabled computers can connect to it without interference. Don't put it inside a metal cage (like a caravan) when you need access outside. At the least, put it in front of a window in the direction where outside Laptops are going to be located. Now the Local Area Network (LAN) is online, any other laptops can connect to the AP. All SARTrack computers (except the Server) should be set up for automatic connection. In Setup/APRS_Server, select 'Automatic" and click OK. SARTrack should now automatically connect to the Server (as long as they are on the same LAN). The "IServer" label on the Main Menu should turn green after a short while. If it won't connect, try Manual access. From this moment on, all connected SARTrack share the same data. All SARTrack computers which come on-line later must open the Operations Log window, select "New Active Log", and enter the name of the current SAROP and the Operator name, to avoid confusion with any previous Operations Log data. SARTrack has a special LOG window for the Radio Operator. 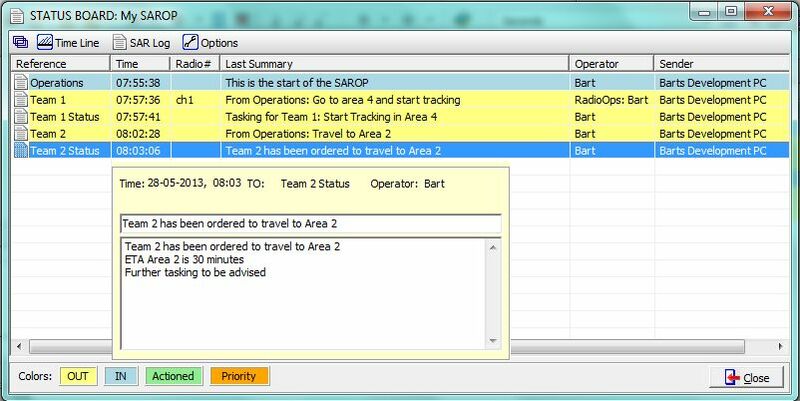 This 'RadioOps' window is a simplified version of the standard Log window, and only contains these fields which are required to transfer information between the Teams in the field, and the SARTrack computers located in the Operations area. It is assumed that the Radio Operator is not located in the same area as Operations, but in another area. Because of this, and the importance of the link between the Radio Operator and the Operations area, it is critical that the Network link is without interruptions. It must be checked that WIFI access at the Radio operator's computer is strong and reliable. If this is not the case, a long network cable should be used to connect this computer to the WIFI Access Point direct. As mentioned in chapter Preparations, Internet access is a huge help if it can be established. If you have access to a two-way Satellite Internet connection, this should be connected to the same Local Area Network (LAN) as the SARTrack computers. Possibly, the satellite equipment comes with its own LAN/WIFI system, in which case all computers should either use that LAN, or the satellite LAN must be connected to the other LAN/WIFI AP by cable, probably to the WAN port. This falls outside the scope of this document, and should have been tried and tested before any SAROP. If there is any chance that Broadband phone coverage could be available, use the 20 meter USB extension cable and Broadband dongle (mentioned in Preparation) to try to connect to your local service provider. The USB dongle can be connected to any of the SARTrack computers, as long at this computer has the dongle's drivers installed. Locate the dongle (in a small plastic bag against the rain) at the highest point possible. If a tree is available, use a long piece of string to hang it in the top. Else, a long fishing rod can be used as a mast. In any case, get it outside the building and as high as possible. If an Internet connection has been established, on the same SARTrack computer which has the dongle plugged in, connect SARTrack to an outside APRS Server. If you are going to use live tracking of APRS Radio Trackers, or GPS data from commercial Voice/Data radios, you must connect a SARTrack computer to the APRS Modem (TNC) or one of the Radios, using a USB cable. For APRS Live tracking, we recommend the TNC-X radio modem. SARTrack currently supports the Kenwood Fleetsync radios. Connect the TNC or Radio to any of the SARTrack computers, and in case of a TNC, connect this to a hand-held Radio on the APRS frequency. In both cases, you MUST use an external antenna, outside and as high as possible. In SARTrack Setup, select Modems, and enter the appropriate data. Make sure the COM port is correct, and not conflicting with any other COM ports on the computer. You can find (and change) the COM port used by the USB device in Windows Control Panel/Hardware_and_Sound/Device Manager. In the Device Manager/Ports, you should see your USB Device used by the TNC or Radio. By going into on Properties/Port_Settings/Advanced, you can change the COMPort if required. Afterwards, select the same COMPort in SARTrack. GPS devices must first synchronize with the GPS satellites, before they can be used. The way GPS works, is that the GPS unit must receive every available satellite un-interrupted for at least 30 seconds. Any interruption during this synchronisation process, and it has to start again. The GPS will not be able to report any position, until it has done this for at least 2 satellites, but you should try to get 8 satellites working. Because of this, it is very important that you activate all GPS devices (APRS Trackers, GPS enabled Radios, and Smartphone Trackers), and put them outside with a clear view of the sky for at least 5 minutes. Once the GPS unit has synchronized itself with all available satellites, it will then keep working even when short interruptions occur when your Teams disappear into the bush or steep gorges. If a GPS Tracker is simply switched on, put in a backpack, and then immediately disappears into the bush, due to the continuous interruptions caused by tree's etc., the GPS may never initialize, and may not work at all. Locally, this means that SARTrack laptops can be used as if they where multiple monitors, each showing a different window. For example, one laptop shows the Map with all Tracks, locations, Objects and Search Areas, another shows the Operations TimeLine, another the Log Status Bulletin board, while an IT operator works on his/her laptop adding data to the Operations Log and entering Objects on the Map which will update all other computers. While in the meantime, the Radio Operator, using the special RadioOps Log window, relays all communication between the Teams in the field, and the Operations room. And, if Internet is available, external advisors or central Operations Centres can participate in the SAROP in the same way as if they where on-site. SARTrack has a special LOG window for the Radio Operator. 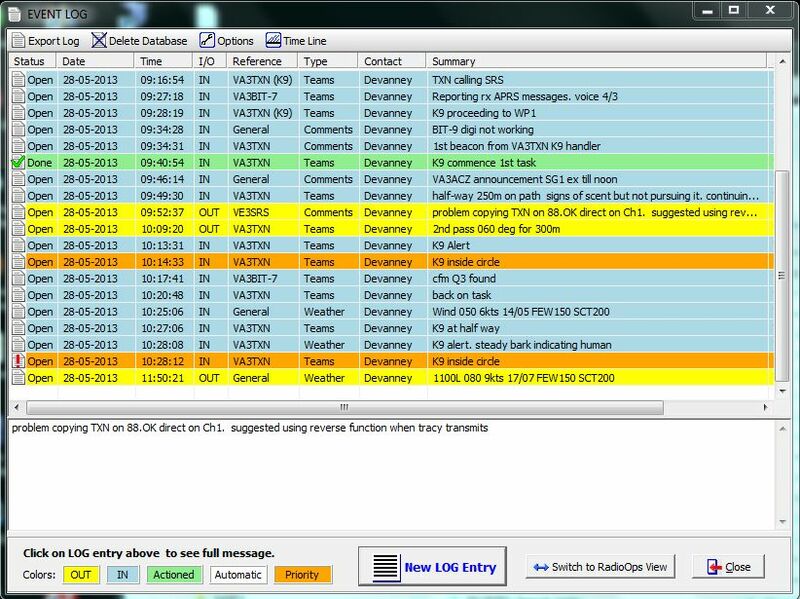 This 'RadioOps' window is a simplified version of the standard Log window, and only contains these fields which are required to transfer information between the Teams in the field, and the SARTrack computers located in the Operations area. The time of people running between the Radio area and the Operations area with hand-scribbled pieces of paper should now be long gone! SARTrack's Operations Log system is designed not only to deal with all standard Operations log entries, but also to supply a reliable, and documented link between the Radio operator and the Operations team. The Radio Operator should if possible have a sepparate person sitting next to him/her entering all incoming Radio traffic into the Log. The Radio Operator can see the laptop, and transmit all messages from Operations to any Team by reading it directly from the screen. On the Operations side, you need one person who does nothing else than entering data into the SARTrack network. This person should be dedicated to just that job. The Operations Managers should NOT have to enter all their own data. They should Manage, and use their own SARTrack laptop(s) to view all available data, on the Map, TimeLine and Bulletin Status board. Once again, the person entering all data into the Log only needs good typing skills, and does not have to be a SAR specialist. - Operations managers can concentrate on their job, having full access to all available information, the moment it comes in (including radio messages from teams in the field: They see them as soon as it is entered at RadioOps). - All information is permanently Logged. This includes all Radio traffic, tracking, entering of Objects on the screen, Messages send and received, etc. This Log will tell the story of the entire Operation, and can be used afterwards by Police and Coroner if required. This document is not a complete Help file on how to use SARTrack. Please use the Help in the SARTrack program (though admittedly, it is very incomplete). - All Map access should be done with an External Mouse, not with the Laptop pad. You can drag the Map with the left mouse button, and Zoom with the mouse wheel. Right-click accesses the popup menu. From the Map window, Search Areas can be drawn. They are limited to 26 points, due to the fact they must be transmitted to all other SARTrack computers, but you can string them together. Objects (Map Markers) can be added on the Map. They could be positions of Teams (manual entry), items found by the teams, etc. Live Tracking of Teams will be displayed on the Map. Tactical callsigns and Track Color can be changed by Editing the tracker. This information will be transmitted to all other SARTrack stations connected at that time. If Teams positions are added manually (and this is not recommended, they should have a GPS Tracking device) they will be added as an Object with a Track. Messages can be send to any Station or Message enabled Tracker. This will open a new Chat Window for the conversation with this station. This is a very usefull feature to communicate between SARTrack computers at remote locations, to discuss issues. Group Messages can be send as well. When you select "Local SAR Group" in the Messages window, a Group message will be send to ALL SARTrack computers connected at that time. The Chat Window which will be opened on all computers will enable you to communicate information intended for the whole Group. This is a powerfull feature of SARTrack, and which distinguishes it from all other APRS programs. - Communicate between the Radio Operator and the Operations Team. - Log all events during the SAROP. - Keep track of the Status of Teams in the field, and other issues. - Enter all comments and ideas from the Operations team. - Entering Weather and Tide information. - Automatically log: Entering of Objects and Search Areas, All Messages being send and received. The Log can be displayed in three ways. - The Standard sequentional Log window. All Log entries are shown sorted by time. New Log entries can be made from this window. 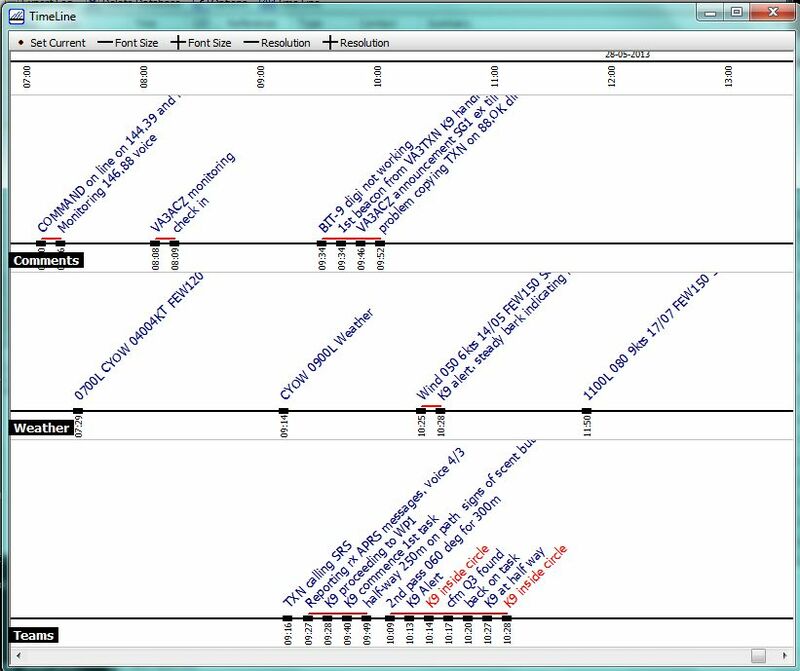 - The Log TimeLine window. This 'white board' window shows selected Log entries on several Time Lines, like Teams, Clues, Weather and Map Markers. New TimeLines can be added, and the size and order in which they appear can be changed. - The Log Status window. This windows shows the latest entry by "Reference" field in the Log. When a new Log entry appears for a certain "reference" (like 'Team 1' or 'Team 1 Status') this entry will replace the previous entry on the window. How to use the Log. There are two versions of the Operations Log window: The Standard version, and the Radio Operator version. The latter is a simplified window, with only those fields included the which the Radio Operator needs. The Standard Version is the one which should be used by all other Operations people. By clicking on the New Log Entry button, a Log Entry form will appear. There are several (pull down) fields which are required to be selected. - FROM/TO: In which direction does this Entry go? The reference field following the FROM/TO field is a critical field, as it links the LOG data to Teams on the field, and any other items in the operation. The pull-down list will automatically be extended when new entries are added, but also when Tactical Callsigns are received from Trackers in the field. The Reference will be used to generate the Status window, where the last entry relating to the Reference will be displayed. The Log Type field is used to select the relevant Time Line for this Log entry. The default is "Standard" which will not show on the Time Line window. Some other available entries are: Teams, Clues, Comments, Map Markers, etc. However, these are user configurable. You can remove Time Lines, and add your own. Only the "Map Markers" Time Line cannot be removed, as this is the default location for all Objects (Markers) which are added to the Map. It is possible to change the Log Type (and therefore the Time Line on which it appears) afterwards, by right-clicking on the Log entry, and selecting "Transfer to other TimeLine". This will mark the Log entry as a Priority by displaying it in a red color. When a Team reports GPS coordinates, it can directly be added to the Map from the Log entry window. This should be used with extreme caution, as an incorrect entry will cause the resulting Map Marker to be displayed at the wrong location on the Map, and if a Track is used for this Marker, moving the Marker afterwards to the right location will still leave an incorrect track on the map. The Summary is displayed on all three Log windows (Log, TimeLine and Status). The full multi-line Body is displayed when the Log entry is selected. - When entering text in the Body, but not in the Summary, the first line of the Body is copied to the Summary. - When entering text in the Summary, but not in the Body, the Summary is copied into the Body. Otherwise, the Summary and Body are saved as entered. ** WORK IN PROGRESS. This paragraph is not finished yet. SARTrack is based on the APRS (Automatic Packet Reporting System) protocol to transfer all data between local and remote computers. This means, that currently every SARTrack computer has its own local databases for Stations, Objects, Messages and also the Operations Log. As a result, not all these databases across the SARTrack computers will be the same. The computer which is on-line the longest, will have the most complete databases. This is why it is critical that the 'primary' Laptop (to which all other SARTrack computers will connect) should be on-line from the very beginning, and stay on-line un-interrupted until the SAROP is finished, and this is the computer from which you later retrieve/export/print the Operations Log and other data. Any SARTrack computers which come online later in the SAROP, will not have any of the previous data. They can however request an "Update" from the primary laptop for Tactical callsigns and Track Colors of all Trackers in use, Objects (Map Markers) and Search Areas. This option is available from the OSM Map window. A new Database system is in development which will incorporate a central SQL Database server, running on the primary laptop. This will resolve the issue of all other SARTrack computers not having the full picture, but it will obviously still be required that the primary Server laptop will be on-line the entire SAROP. Power considerations at remote locations. Power at remote locations is always provided by portable generators. The problem with this is, that they need to be refuelled on a regular basis, and while this happens or when it runs out, the power will fail. For some equipment this it not an issue, for example all Laptops will keep running on their own batteries for some time. However, printers, video projectors and LAN equipment (WIFI and routers/switches) do not have a build-in battery backup. The way around this, is to run some of them directly on car batteries if they are capable of operating on 12 volt, or to connect them to a large inverter which itself is connected to a large 12 volt car battery. What you should NEVER do, is to try and connect an UPS (Un-interruptible Power Supply) unit to a portable generator! While a UPS is in fact an Inverter connected to a (internal) 12 volt battery as mentioned above, it is designed to detect any fluctuations in voltage and/or frequency of the incoming power. When connected to a small portable generator, any fluctuation will cause the UPS to switch all its connected equipment from generator power to the internal inverter. At this point, the generator will suddenly be unloaded and after a wild swing, will stabilize. The UPS will detect this, and reconnect all equipment back to the generator. Which will suddenly get a full load, drop in voltage and frequency, and the UPS will immediately switch back to internal power. This may happen several times a second, and the internal relays will be rattling like castanets. I have seen a large UPS burn out during a SAREX due to this, and the entire area was without power. So, the best option is to use a large inverter (2 Kw or more) connect this to a (set of) car batteries, and use a large battery charger to keep the batteries charged during operation. This may seem a bit of work, but it gives you a stable (non-fluctuating) 230V (or 110V) power source, which will never fail, even when the generator goes off-line for refuelling. NO power = NO Network, NO communications, NO SAROP! In Automatic mode, the red "IServer" label on the Main Menu should change from red to yellow (it is searching) then to green once it has found the Server. If for whatever reason it cannot find the server (it stays yellow) you can manually connect to the server by entering the Server IP address and port number. The Server IP address can be located in the Server's Tools Menu. On the client computer, in Setup/APRS_Server enter the Server IP address. Enter Port number "10152". Check "Connect" and "Two Way Traffic", and click OK. It should now connect. If not, you have a network problem. Which APRS Server should you use? Before any SAROP, you should have made a decision which APRS Server you are going to use for your SAROP's (assuming you may have Internet access). - APRS-IS. An Amateur Radio only world-wide network. Only licenced Amateur Radio callsigns can be used. All your SAROP traffic will be transmitted across this network, and while the Operations Log and Messages are encrypted, all other data is not: Location of Trackers, Objects on the map etc. Unless you need the APRS-IS network, because you are going to use existing APRS Radio Repeaters and Gateways, it is not recommended that you use APRS-IS. - FireNet. This is a world-wide APRS network, which includes the Amateur Radio APRS-IS network, but also non-amateur stations, using their own made-up callsigns. You can use this, but as mentioned above, all your data will be transmitted world-wide, and for no good reason. - Private APRS Server. This is the recommended way. A private APRS server provides a way to connect your remote SAROP communications to the outside world, but only for stations which specifically connect to this server. So, your traffic stays private, but any station (SARTrack computer) anywhere in the world can participate in your SAROP when they connect to the same server (and use the same Group ID). SARTrack Limited has set up two private APRS servers for this purpose, one in New Zealand and one in the Netherlands. New Zealand Server: sartrack.co.nz Port: 10152 (unfiltered) or Port 14580 (filtered). Netherlands Server: sartrack.nl Port: 10152 (unfiltered) or Port 14580 (filtered). The two servers are currently connected to each other. You can also decide to set up your own private APRS server in your own country. Contact info@sartrack.co.nz for more information. The merger of an existing "OSMMAPS" directory (target) with a new one (source), will override the existing target Database for each Map. This means any existing Map tiles on the target computer will become inaccessible (but they are still on disk). To fix this, from the OSM Map window, select 'Options/Rebuild OSM database'. This must be done for each Map separately. As this may be very time consuming, it is not worth doing this if the target computer had only very few Map tiles on it. However, if you want to make sure that the original Map Tiles on the target computer and the new Map Tiles copied from the Source computer are all accessible, this is the way to do this.